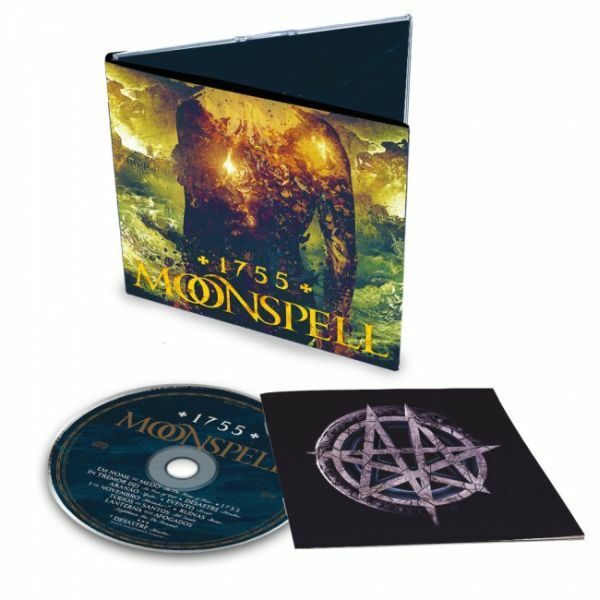 MOONSPELL - 1755 LTD. EDIT. (DIGI) | Online Shop | Wizard LTD. Album: "1755 LTD. EDIT. (DIGI)"
Dark Metal&apos;s finest art project MOONSPELL outclasses all standards with their colossal new release "1755". The twelfth record from these Portuguese gothic masters is an orchestral adventure including siren like choirs with a Wagnerian pomp! Strings, bongos, oriental singing, grand guitars are just a tiny part of this amazing piece of work. From the first superincumbent second, the conceptual dramaturgy of MOONSPELL&apos;s work feels like a detonation of the mind. Playful and mean-spirited. "1755" is their magnum opus. This musical masterpiece represents the year of horror where a giant earthquake wrecked their home of Lisbon. Naturally this album is sang completely in Portuguese. The album features Paulo Bragança, supplying a hauntingly voice of a Fado fallen angel who is a big part of the Portuguese culture. His fascinating vocals are featured in "In Tremor Dei" (eng. : "Fear Of God"). "1755" is an adventure in medieval landscapes full of threats, guarded by stirring hymns including the bad luck "Desastre". Choirs filled with fear stab into the wild disharmony of the guitars. The album is emotionally, technically and completely breathtaking!